The Lincoln Social Computing Research Centre is hosting a Windows Phone 7 (WP7) workshop with Microsoft on Wednesday March 7th @1pm-5pm – by registering and coming along you could be in with a chance to win a brand new Nokia Lumia 800 on the day! 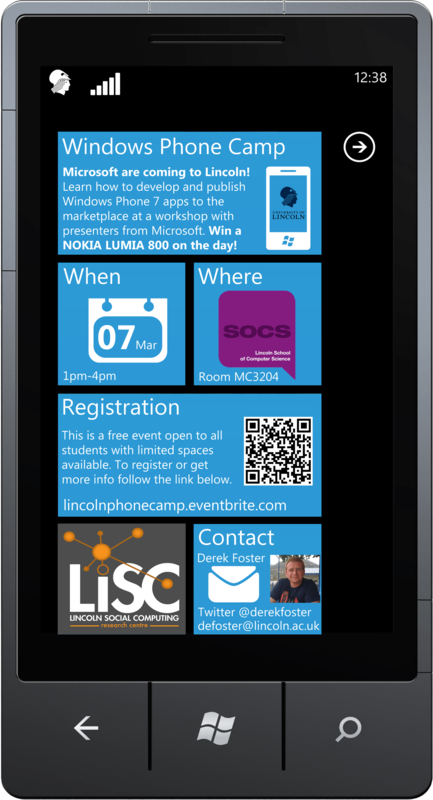 The event will take place in the Lincoln School of Computer Science in room MC3204 (Comp Lab B), and will include presentations by Microsoft on WP7 followed by a coding session then finishing the day off with pizza. If you are interested then it would be helpful to familiarise yourself with developing for WP7 using Visual Studio 2010 and the WP7 ‘Mango’ SDK, by doing so you will get more out of the workshop. All machines in room MC3204 are installed with the prerequisite tools if you want to get a head start! WP7 is Microsoft’s brand new mobile operating system, built from the ground up to compete in today’s smartphone market. It features the innovative new ‘Metro’ interface which is also heavily present in the upcoming Windows 8 operating system. Metro applications are built using Silverlight and XAML, an interface mark-up language, with C# or VB.NET behind code. By learning to build WP7 apps using XAML you will be able to use the same programming skills to build Windows 8 Metro applications. If you have any questions regarding the event then do get in touch either through email @ defoster@lincoln.ac.uk or Twitter @ derekfoster. For more info and registration please follow this link: http://lincolnphonecamp.eventbrite.com , places are limited so please register early to avoid disappointment.